We've been attending HTC press conferences for over a decade, and they've never failed to deliver at least a sliver of excitement. That's ranged from a belief that this brand could take on the iPhone with the HTC Desire (which it did) to charting new territory into virtual worlds with the Vive headset (which offered a possible, exciting view of the future rather than an amazing product we could buy right now). Fast forward four years from the launch of the Vive headset, and we're still not living in a VR-powered world. Instead we're at CES seeing the launch of another VR headset from HTC, the new Vive Cosmos - or, at least, we think we are. Announced by HTC stalwart Drew Bamford, who's now VP of Creative Labs within the brand, it promises to be the next step in virtual reality in terms of getting access to VR on the go - but right now, that's a mysterious promise. The reason is simple: HTC announced a lot at CES 2019, like eye-tracking tech for its high-end headset and a 'Netflix for VR titles' service, and they all carried the standard level of excitement that new VR launches bring (because, despite the fact that it’' not hit the mainstream yet, VR is still awesome when you try a fun and immersive game). But nothing offered the most important thing: clear, defined timescales and prices about when you can actually buy this stuff and how much it'll cost. Take the VivePort Infinity for instance: as mentioned, it was dubbed the 'Netflix of VR' by HTC, a chance to get access to 500+ apps and games whenever you want, there was no mention of price beyond 'a low monthly sum'. Why not tell us the cost? Why not explain why, when the brand has just told us that it's added 1,000 new games this year, we're only able to access 500 of them? The reason is probably just licensing, that some developers don't want to have a small cut and would rather sell their wares for the full price. That's fine, but it's confusing to the consumer when the answer clearly exists, and if it doesn't - then why launch now? The lack of clarity gave the impression that HTC still doesn't have a high-quality veneer with its launches - that it doesn't have a clear, defined strategy for getting its VR platform in the hands of millions of paying consumers. To the user, it's fine if a VR announcement doesn't apply to them at the moment. Nearly half a decade later, VR still isn't something people are desperate to own, and they don't feel the loss as they've never tried it. HTC is also clearly doing better in the professional space (creating tie-ins with brands like Audi, BMW and Major League Baseball) than it is in the consumer arena when it comes to pushing forward with its Vive development, and that's great for the future of VR too. It can work out the high-end tech problems needed to make VR a slicker experience with brands willing to pay huge sums to use it, to get the awesome experiences VR can bring to their customers, and eventually everyone will benefit. The thing is, when something like the HTC Vive Cosmos is launched and it's not fully explained, it's incredibly frustrating because it doesn't give VR the platform it deserves. It doesn't tell consumers why they should be excited. So when a picture of the new Cosmos headset being shown on stage with a smartphone nestled inside, but the brand is only saying 'it'll be powered by a gaming PC, and also be powered by more than that', it's annoying. So, it's clearly going to work with a smartphone. Why not just say that? What does that mean? Clearly it's going to work with a phone… but how? Will it be wired? What's the resolution? Why do the handsets that come alongside light up, when you can't see them in the virtual world (although they do look pretty cool, like bracelets you'd wear in the Tron world). This is the issue with launches like the HTC Vive Cosmos, that we're told is 'coming soon'. Why hint at something that consumers will get the most excited about and then not elaborate any further? We get that it’s fun to tease something at the tail end of a press conference, but this was more than a hushed nod to a new product. It was a launch in tone, but one that didn't fill in the blanks. It's clearly an eyelash-flutter to gamers, telling them that HTC still cares for them, but didn't tell them why they should stay interested. The reason this is so frustrating is that this could be what people have been waiting for, an HTC Vive headset that's powered by your smartphone, that you can take with you on the go and get these immersive worlds whenever you need them. Because, if we haven't made it clear enough yet, VR is still a really cool experience. And it's getting better - looking at the demos offered by HTC to show off the new eye-tracking tech in its Pro headset prove that VR is far from dead. It still could very well be the future of entertainment. The HTC Vive Focus seems similar to the Cosmos - the brand needs to make sure they're clearly differentiated. Even the flip up cover of the HTC Vive Cosmos feels like a nod to the movie Ready Player One, similar to the movie poster that shows the protagonist flipping in and out of the virtual worlds. We’ve pretty much given up on HTC coming back as the smartphone powerhouse it once was - perhaps the brand realised it had a bigger chance of success in VR, where it’s the leader in the space. 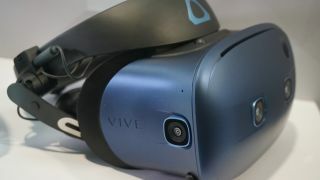 At some point it’s going to have to entice consumers back - and while today hinted at that future, with the launch of Vive Reality Origins and Portal, a dedicated virtual world to interact with chums and jump between games, we still don’t have something to get excited about beyond a new demo headset that won’t turn on alongside some shiny handles. So come on HTC - let’s hear more about this Cosmos headset. The world will flock to VR when you make the headsets easy to use, cheaper and less cumbersome, we have no doubt about that - but we need to believe that future is still on the way.